Altar the night of Day of the Dead. Notice the bread with the cross on top. I am not one to believe in a lot of hocus pocus, though I want to believe there are things we can't explain. I want to believe that if you fly into the Bermuda Triangle you will disappear. Maybe. But I don't put a ton of stock in these things. I don't wave incense around to ward off, or draw to me, certain spirits. But, still….. Sometimes things happen that defy explanation. 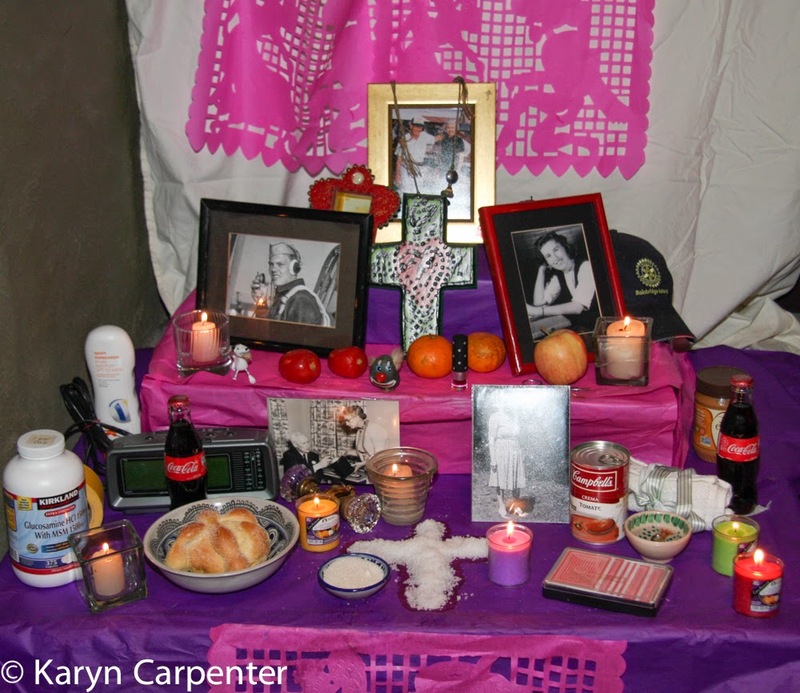 This year, I built an altar to my parents for the Day of the Dead. Did I think their spirits would return to the altar? No. Heck, I know they wouldn't. I cut down a tree a couple days after my mom died that was smack dab in front of her house. She loved the tree. I hated it. I knew that if there was ANY way that she could return to give me a good haunt, it would happen the night I butchered that tree. She did not return. But, out of respect for my new Mexican life, and to honor my parent's memory, I built an altar. On November 2, the Day of the Dead, I moved it to the front of my house. Here it was back from the street, visible from the sidewalk but protected from the elements. Positioned as it was and behind a locked gate, no human could reach it. I added the things I was told were needed. Tomatoes for Mom, fruit and other food my parents enjoyed. I bought the special Mexican sweet bread that altars are to have. It is a yummy piece of dough, perhaps 6" in diameter. On top, a cross of dough is baked into the bread and sugar is sprinkled across it. I placed my bread in a bowl near a cross made of salt and a small bowl of sugar. That night, I lit the candles and took a few photos, finally blowing them out before going to bed. The next morning I awoke and went outside to check the altar. Everything was as it had been the night before. The trinkets were in place, the food untouched. (Apparently the spirits don't eat the food but the nourishment from it is gone after their visit.) Photos weren't moved. The cross of salt was totally intact - unmoved by wind, critters or departed souls. But, in the bowl, the bread……… No human could have reached this and no critter bothered it without disturbing something else. But something had come in the night and eaten half the bread. Something, somehow turned that bread over so as not to disturb the cross. The bread was carefully returned to its place in the bowl and the bottom half of the bread eaten or removed. That who or whatever did this refused to eat the cross and carefully replaced the bread into its bowl is just too bizarre for description and defies all logic. Did some soul return for a snack on this Day of the Dead? Somehow, that is the only thing that makes sense to me - and it sends shivers down my spine.